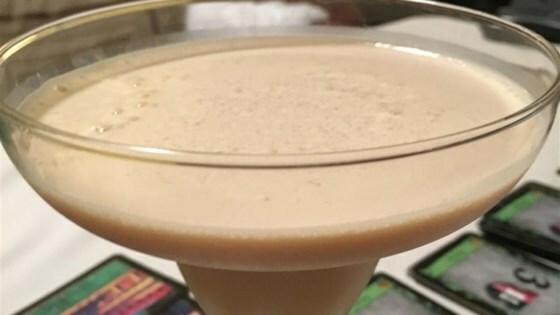 "This festive Autumn martini is like pumpkin pie in a glass. Try coating the rim of the glass with cinnamon sugar or sprinkle nutmeg on top as a garnish before serving." In a cocktail mixer full of ice, combine pumpkin liqueur, spiced rum and half-and-half. Shake vigorously and strain into a chilled martini glass. We made it with heavy cream instead of half-and-half. It was a little too sweet, but not horrible. Maybe better in small doses. Everyone I made this for, thought it was horrible. I think it has alot to do with the brand of pumpkin liqueur that you use. Mine did not even taste like pumpkin in the first place. Very smooth & just the right amount of sweetness. Sprinkled nutmeg on the top. Super delicious if you are a pumpkin lover it is a must try ? ?